4-amino- 3-phenylbutyric acid - Research has shown that 4-amino-3- phenylbutyric acid crosses the blood/brain barrier, and it can also be absorbed more efficiently than GABA (gamma aminobutyric acid). This anxiety-reducing and cognition-enhancing agent is also called phenibut or fenibut. Fenibut has been studied for its ability to prevent the negative effects of sleep deprivation, namely protecting the adrenal glands and reducing cognitive and emotional disorders caused by lack of sleep. It has also been researched for its ability to reduce anxiety. Phenibut is commonly used in Russia to improve anxiety, sleep disorders, depression, post-traumatic stress disorders, and more. L-Taurine - is an essential amino acid is a GABA-receptor agonist, meaning it produces a GABA-like effect in the body. GABA is a sedating, inhibitory neurotransmitter. In animal studies, application of taurine with GABA, or taurine with glycine produced stronger effects than taking either glycine or GABA alone. (iv) Taurine is can be used to enhance sleep quality. L-Glycine - is a non-essential amino acid. It has been used to protect brain cells after ischemic stroke. Glycine is also thought to promote a sense of well-being and reduce anxiety. Research has shown that glycine can subjectively and objectively improve sleep quality. (vi) In a study where people’s sleep was restricted, glycine also reduced daytime sleepiness. 5-HTP - stands for 5- hydroxytryptophan, and is used by the body to make serotonin. 5-HTP is not found in food sources, the body manufactures 5-HTP from tryptophan, an amino acid found in dietary protein. Many conditions have been shown by studies to be helped by 5-HTP supplementation, including insomnia, depression, fibromyalgia, obesity (by reducing appetite), and headaches. 5-HTP should always be used under the supervision of a healthcare practitioner. In addition, the lowest possible dose should be used first and the dose should be titrated up slowly. 5-HTP should not be taken concurrently with pharmaceutical anti-depressants unless otherwise directed by your healthcare practitioner. Vitamin B-5 (D-Calcium pantothenate) - is a water-soluble B vitamin with numerous biological roles. Vitamin B-5 is used by the body to manufacture, among other things, coenzyme A which is an important compound for energy metabolism and the production of fatty acids, cholesterol, and the neurotransmitter acetylcholine. D-Calcium pantothenate is the preferred, metabolically active form of B-5 used in higher quality nutritional supplements. Vitamin B-6 (Pyridoxal 5-phosphate) - is a water-soluble B vitamin that performs many functions in the body. B-6 – dependent enzymes assist in the biosynthesis of the important neurotransmitters GABA, dopamine, serotonin, epinephrine, and norepinephrine. Pyridoxal 5-phosphate is the preferred, metabolically active form of B-6 used in higher quality nutritional supplements. 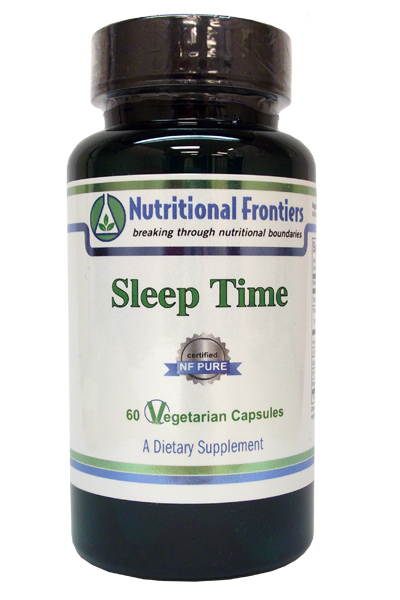 Melatonin - is a hormone naturally produced by the body to regulate circadian rhythm (sleep-wake cycle). Melatonin secretion may be disrupted by aging, hormonal changes, and night-time exposure to light, among other things. Melatonin supplements are well known for their ability to combat insomnia.